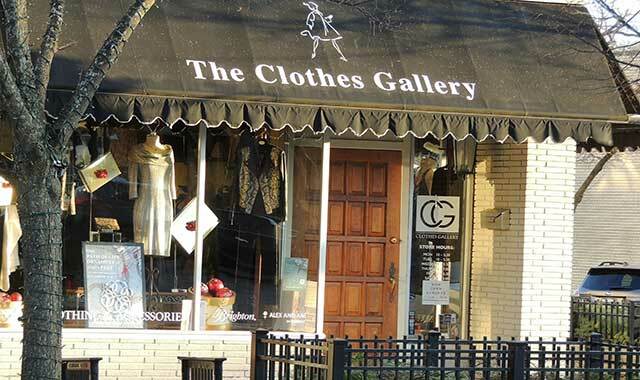 The Clothes Gallery, in downtown Crystal Lake, is a women’s boutique that serves up the latest fashion and many unique Valentine’s Day gift ideas. The holiday season may be over, but downtown Crystal Lake still has much family fun to offer this season. The town is chock-full of charming boutiques, tasty eateries and exciting entertainment venues. The best way to start off a trip to Crystal Lake is by dining at one of the town’s many locally owned restaurants. In the mood for a slice of pizza? Georgio’s Chicago Pizzeria and Pub serves up deep-dish without having to travel to the city. Or maybe you’re wanting something a bit upscale. Check out the decadent, but approachable, French cuisine at Retro Bistro. Beer lovers gravitate toward Crystal Lake Brewing for a freshly brewed pint. The homegrown brewery is known for its Beach Blonde Golden Lager, Fox Rocker American Red Ale and Overboard Oatmeal Stout, among others. If you’re a fan of shopping, there’s no shortage of boutiques and specialty stores to choose from in downtown Crystal Lake. The Winter Slidewalk Sales are a bargain hunter’s dream. “Run, slide, skate or ski into Crystal Lake’s Slidewalk Sales,” says Kenney. “Don’t let the winter weather stop you from enjoying fabulous bargains at many of your favorite retailers.” The Slidewalk Sales run Jan. 18-20. Get in some Valentine’s Day shopping at The Clothes Gallery, an upscale boutique. Featuring women’s clothing and jewelry, the store is an ideal place to find a unique gift for the special person in your life. Owner Sherree Rothstein suggests a piece of jewelry from one of the store’s designer lines as a romantic Valentine’s Day present. Plus, it’s never too early to start shopping for those future getaways. Lovers of vintage items will find plenty of deals on high-quality furniture, collectibles and more at Crystal Lake Antique Mall. With more than 8,000 square feet of antiques on display, the store holds treasures that appeal to every member of the family. Kids (and parents, too) start to get cabin fever right around this time of year. Families can work out their energy at the Metro Bowl, Downtown Crystal Lake’s vintage bowling alley. On Thursdays, the alley features “all you can bowl” for just $10. That’s a lot of time to perfect your strike technique. There’s also plenty of entertainment to check out at the Raue Center for the Arts this winter. In addition to featuring plays, comedy shows and performances by touring artists, the theater now plays old movies, as well. Showings of “The Sound of Music” and “The Princess Bride” are on tap for February and March, respectively. If you find yourself in Crystal Lake this winter, you’re in for a load of fun, and more importantly, you’ll be supporting hometown merchants. For more information on visiting downtown Crystal Lake, check out downtowncl.org. Winter’s begun and you might be thinking the sun hasn’t peeked out for days. Don’t let the weather bring down your mood. Instead, lift your spirits and grab some indoors fun with a variety of nearby cabin-fever busters. Northern Illinois University in DeKalb is a highly recognized public research university, but it’s also home to the NIU School of Music, which holds more than 225 concerts and recitals during the year. The public is invited to enjoy a large range of music, from classical and jazz to world music and experimental – all performed by the school’s talented students. Down the street, the well-known Egyptian Theatre in downtown DeKalb heralds a varied lineup of live musical and comedy shows for every taste. The winter schedule includes comedy, percussion and jazz, plus a Beach Boys Tribute that’s sure to take you away from the winter winds and into the summer sun. Besides an enjoyable musical pick-me-up, you’ll find the Egyptian Theatre a must-see unto itself. It’s one of five remaining theaters done in the Egyptian style and the only Egyptian Theatre east of the Rocky Mountains. The building’s storied architecture provides a spectacular show all its own. If you’re hungry, there’s always time to enjoy a special meal or brew in DeKalb. For more than 60 years, the quaint family-owned Hillside Restaurant has pleased the palates of many locals who crave this institution’s varied traditional menu, famous chocolate cake and seasonal desserts. Fatty’s Pub & Grille is the place for NIU postgame meetups, with burgers, brews, stuffed sandwiches, and a whole lot more. It might take a while to make a selection from the wide menu, but take your time. The TVs are always running the latest games. Fatty’s also serves DeKalb’s very own Whiskey Acres Distilling Co., local spirits served in drinks such as the Whiskey Acres Dancing Ginger or Whiskey Acres Old Fashioned. Looking for musical entertainment in another historic location? 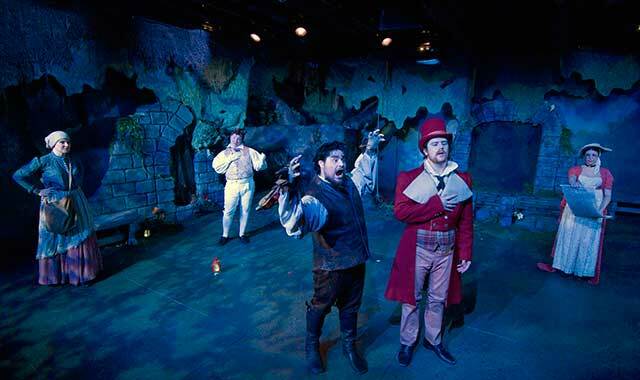 Drive south to nearby Sandwich and visit the Sandwich Opera House. Enjoy “Listen Local Fridays” and watch local artists play every Friday night. The former Sandwich City Hall and Opera House, which opened in August 1878, has been restored and renovated by passionate community volunteers. Their efforts are ongoing and supported by a number of grants, including the 2016 DeKalb County Community Foundation Needs Grant. The building serves as a community-oriented facility that brings performers, community theater, lectures, recitals and traveling shows to its stage. For your tasting pleasure, stop by the popular Prairie State Winery to try some award-winning wines at tasting rooms located in Genoa and Sycamore. The Genoa location has a full-service kitchen, which is open Thursday through Sunday. Take a break there with “Wine Downs” every second and fourth Friday of the month, or take in the “Sunday Blues” with live music on the weekend. DeKalb County is located just 60 miles west of Chicago and is easily accessible from Interstate 88. For more information on entertainment in DeKalb County, visit dekalbcountycvb.com. Green Lake When you’re in Wisconsin, you make the most of the winter season. At The Edgewater, in Madison, Wis., seasonal fun includes events outdoors and a relaxing spa indoors. The lights of the Chicago region fade in the rearview mirror as you head northwest into Wisconsin. In less than three hours the glittering waters of Lake Mendota are visible from behind the two towers of the four-diamond Edgewater Hotel in Madison, Wis. Here, you’ll trade the bustling streets of suburbia for a relaxing retreat at a recently revived urban resort located just steps away from another famous State Street – this one near Capitol Square. Since 1948 the Edgewater has been a place for fabulous fêtes, and in 2014 a $100 million renovation elevated the elegance and restored the upscale feel of its former glory. “There are two sections of the Edgewater,” explains Rebecca Werner of Werner Public Relations, the hospitality specialists representing the hotel. “There’s the original hotel (now called the Langdon Building), and then there’s the new hotel (the Wisconsin Building) that opened in 2014.” The buildings flank a central plaza boasting views of Lake Mendota to the north and the Capitol Building to the south. The Grand Plaza bridges the gap between the old and the new. It provides a setting where guests skate on the ice rink all winter long, and in warmer months yoga classes, food festivals and concerts take place. The Edgewater offers modern Midwestern cuisine from the locally sourced Statehouse, the “approachable and charming” Augie’s Tavern (named for the quirky former owner, Augie Faulkner), traditional waterfront dining at the seasonal Boathouse and grab-and-go fare from The Icehouse. Featuring a wide array of Wisconsin-brewed beers and idyllic views of both city and lake make The Plaza the place to be, whether the sun shines or snow falls. As you plan your getaway to The Edgewater, be sure to bring your winter gear. In Madison, cold weather doesn’t mean staying shut up indoors. It means getting outside to play. 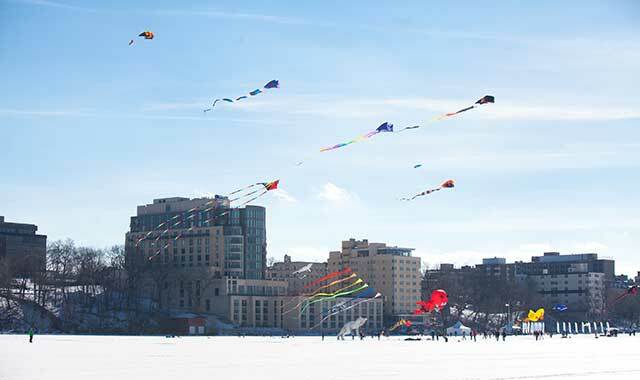 This Feb. 2-4, the Clean Lakes Alliance hosts the annual Frozen Assets Festival in the Grand Plaza and atop frozen Lake Mendota. It promises to be a weekend loaded with family-friendly entertainment like ice fishing, sleigh rides, a Fat Tire Bike Race, and the country’s only 5K run performed entirely on ice. Kids, meanwhile, can also learn and let loose as they check out the science labs and ice skating rink located around The Edgewater. On Saturday, Feb. 3, guests of the Miami Vice-themed fundraising gala will enjoy an evening of live music, craft cocktails and hors d’oeuvres at The Edgewater. Known for its creative concept and guests’ inspired fashions, the fundraiser typically raises more than $150,000 for the community’s top asset: area lakes. Of course, if you prefer cozying up indoors, Edgewater Spa and Wellness Center may be your cup of tea. Luxurious spa treatments, salon services, a relaxation pool, and health and fitness classes are available year-round. Whether your weekend is filled with festivities or spent de-stressing in the spa, The Edgewater offers a winter respite, sure to send you home recharged and ready to face what’s left of winter in the Windy City. Green Lake, Wis., is an active playground that has lured families and couples for generations. Its sparkling lake and fresh waters serve as a magnet for those who enjoy the simplicity and beauty of nature. While the Green Lake area is best known for its leisurely summers, this destination in south-central Wisconsin boasts an unforgettable list of activities for cold-weather enthusiasts who embrace a snowy winter. Green Lake Conference Center, located on the shores of Wisconsin’s deepest lake, provides lodging, dining and meeting space for large and small gatherings, many of which are hosted by Christian or nonprofit groups. The Conference Center offers hotel and lakefront house lodging for those who want to relax, enjoy nature and get away for a winter retreat. Surrounded by 900 acres of forest and prairie, the Conference Center provides plenty of scenery for a beautiful hike or snowshoe. Bring your own equipment or rent snow discs, toboggans and foam snow sliders for sledding. This getaway comes with a wide range of amenities and fun to be had. Bring your boots or showshoes for hiking and snowshoeing, or rent snow discs, toboggans and foam snow sliders for sledding. Or, try something new, like broomball. Played like ice hockey, this sport involves players hitting a ball with a “broom,” or stick with a rubber-moded triangular head. Broomball is a popular winter sport in Wisconsin that originated in Canada. 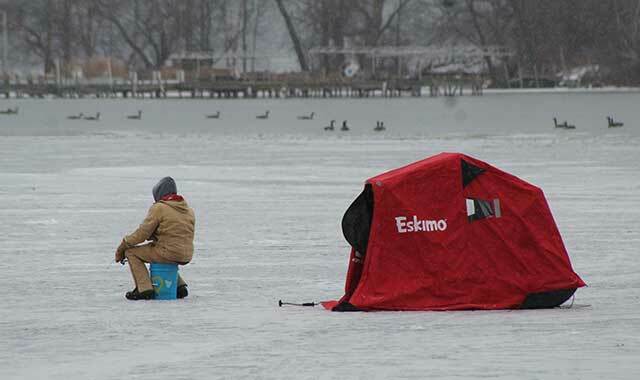 Green Lake is the deepest natural lake in Wisconsin, and it’s a haven for ice fishers. There are a number of fishing guide services in the area to provide equipment and expertise. Cozy ice shanties are sprinkled around the lake throughout the season. If the cold weather cooperates, watch the thrill of the ice-boating competitions, hosted by the Green Lake Ice Yacht Club. Ice must be at least 4 to 12 inches thick, so races are usually scheduled just a few days ahead of time. Craving a getaway to an atmosphere of simpler times? The Green Lake area is home to a number of quality bed-and-breakfasts, including the Greenway House and Angel Inn. Both are open during the cold-weather months. Their hosts offer the ultimate comfort experience with meticulously kept rooms, magnificent views and tasty breakfast pleasures. Just a few minutes east of Green Lake, in Ripon, Wis., is Vines & Rushes Winery, operated by Ryan and Megan Prellwitz on 5 acres of the established Prellwitz family farm. The family’s cold-hardy grape varieties of Marquette, St. Pepin and Petite Pearl survive Wisconsin’s frigid winters to produce the beginnings of quality wines. The tasting room at Vines and Rushes Winery is open year-round, seven days a week. Enjoy a complimentary sip of white wines, red wines and hard ciders. Live music is available on Friday and/or Saturday nights with fresh Neapolitan-style wood-fired brick oven pizza. 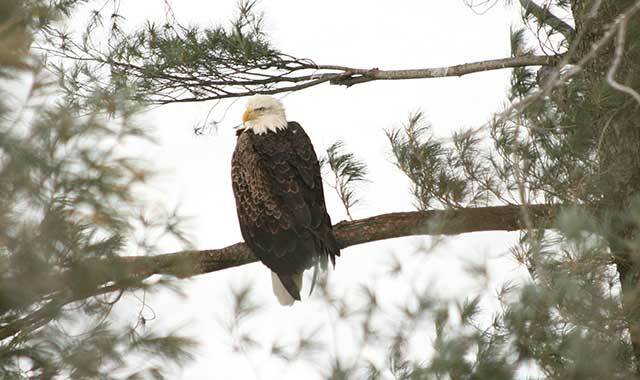 For more information about traveling to Green Lake and ideas for enjoying a winter adventure in Green Lake and its surrounding communities, go to visitgreenlake.com. In less than a two-hour drive, you could be sitting in front of the fireplace in the Great Hall of Starved Rock Lodge, near Utica, Ill. The massive, two-sided fireplace warms the chilly air and welcomes guests from near and far. Hikers love to explore the change of scenery where freshly fallen snow covers canyons to create a winter wonderland. Some visitors hike on their own, while others prefer the added experience of a guided hike to LaSalle Canyon, available every weekend throughout the year. If a wedding is in your future, the Lodge’s annual Bridal Expo is held every January. Starved Rock has become a destination for outdoor weddings in warm weather. Indoor ceremonies and receptions are hosted in the historic Great Hall, and outdoor sites are available, too. Brides and grooms-to-be can sample food for their cocktail hour and reception. Preferred vendors are there to make it much easier to plan a dream wedding. Adventure seekers can sign up for the MegaHike on Jan. 20-21 and travel to each of Starved Rock’s canyons in one day. Musical tribute shows are one of the best ways to beat the winter blues. The Dueling Pianos matinee on Feb. 5-6 is a real crowd-pleaser, and there are additional shows on the 2018 calendar. Younger guests enjoy the annual Teddy Bear Tea in the Great Hall on Feb. 10 with tea, cookies, storytelling and a craft project. If you like to sing, consider entering the Lodge’s annual Rock Star competition, which begins Feb. 15 at 7 p.m. and continues through March 8. The winner takes home a trophy and $500. This entry was posted on Tuesday, January 9th, 2018 at 11:59 am	and is filed under Recreation & Destinations. You can follow any responses to this entry through the RSS 2.0 feed. Both comments and pings are currently closed.